For underground structures such as tunnels, the seismic design approach differs from that of the surface structures (e.g., bridges and buildings). Surface Structures In the seismic design practice for bridges, the loads caused by an extreme event (earthquake) in a seismically active region are often several times more severe than the loads arising from other causes. To design a bridge to remain elastic and undamaged for such infrequent loads is uneconomical and sometimes not possible (Buckle, et al, 1987). Therefore, it is clearly not practical to use the same design approach to earthquakes as is used for other types of loads. 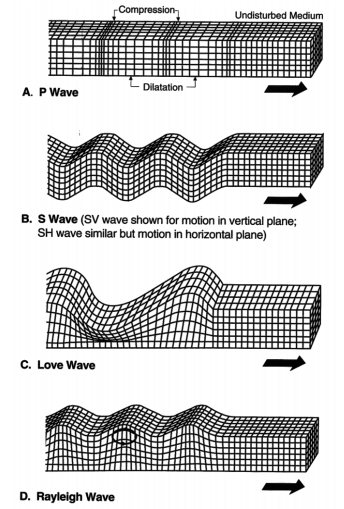 Surface structures are not only directly subjected to the excitations of the ground, but also experience amplification of the shaking motions depending on their own vibratory characteristics. If the predominant vibratory frequency of the structures is similar to the natural frequency of the ground motions, the structures are excited by resonant effects. In contrast, underground structures are constrained by the surrounding medium (soil or rock). It is unlikely that they could move to any significant extent independently of the medium or be subjected to vibration amplification. Compared to surface structures, which are generally unsupported above their foundations, the underground structures can be considered to display significantly greater degrees of redundancy thanks to the support from the ground. These are the main factors contributing to the better earthquake performance data for underground structures than their aboveground counterparts. Force Method for Surface Structures. For aboveground structures, the seismic loads are largely expressed in terms of inertial forces. The traditional methods generally involve the application of equivalent or pseudostatic forces in the analysis. Deformation Method for Underground Structures. The design and analysis for underground structures should be based, however, on an approach that focuses on the displacement/deformation aspects of the ground and the structures, because the seismic response of underground structures is more sensitive to such earthquake induced deformations. The Operating Design Earthquake (ODE), defined as the earthquake event that can reasonably be expected to occur during the design life of the facility (e.g., at least once). The ODE design goal is that the overall system shall continue operating during and after an ODE and experience little to no damage. The Maximum Design Earthquake (MDE), defined as an event that has a small probability of exceedance during the facility life (e.g., 5 percent). The MDE design goal is that public safety shall be maintained during and after an MDE. From: Wang, J-N. 1993. Seismic Design of Tunnels, Parson Brinckerhoff Inc.